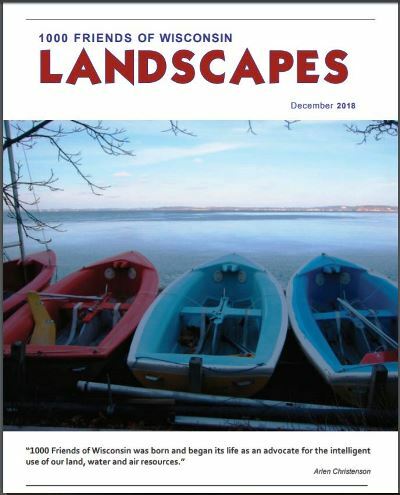 Download and read the full December 2018 Landscapes Newsletter. 1000 Friends of Wisconsin is not your typical environmental organization. After all, who else would preserve farmland by advocating for a Regional Transportation Authority? Or improve water quality by working on a green infrastructure project at a Madison community school? Or curb greenhouse gas emissions through form-based zoning codes? We do things differently. We are focused on connections and making the link between good community design and protection of the natural environment. We know that when we make substantial improvements to our communities, we are having a bigger impact on the world we live in. Everything that we do on the land touches something else. We address policies in communities that are too frequently underestimated in their importance to protecting the natural environment. We have never strayed from our objective to curb sprawl through better use of our lands, but we have taken steps that many others tend to overlook – achieving benefits that go far beyond any one community’s borders. Our natural landscape has been transformed by our highways. Hills flattened, farms removed and wetlands drained are direct results of the highway construction that has extended the reach of the modern commute. Consequently, new housing developments and shopping malls have been created atop former farm fields dismantling many existing communities. 1000 Friends is working to rebuild communities. By focusing on the relationship between community design and transportation, we can help build better places to live. Our plans help residents build neighborhoods that foster economic development that builds great places. With an emphasis on developing transit connections, we can also help residents save money by reducing their dependence on cars and gasoline. A walkable/bikeable neighborhood supports local retail and improves the quality of life. It also means reduced emissions from cars that increase air pollution and contribute to climate change. We helped create the Green Tier Legacy Communities Charter program over 10 years ago to assist communities in developing and implementing sustainability measures leading to an improvement in the economy, environment and quality of life in the charter communities. When communities sign the Green Tier Legacy Communities Charter, they agree to take actions and share information to move continuously toward a sustainable future through initiatives that promote environmental stewardship, economic growth, public health, and social equity. Currently we have 23 Green Tier Legacy Communities and counties across the state! Just this past year we’ve added a Health in All Policy component to the GTLC Charter. We work on Green Infrastructure (GI) projects to protect watersheds and to encourage community members to become involved and understand the impact of runoff and how we can use it to our advantage. We mimic natural processes to capture, filter and infiltrate storm water on site. GI practices include green roofs, rain gardens, native plants and tree planting, and porous and permeable pavements. This is a natural extension of our work because land use and water quality are inextricably bound together. So now when people ask us what we do – we still say we make connections between good land use planning and natural resources protection. We work to bring people together, build collaborations, and find the best ways to do it.